CPR stands for cardiopulmonary resuscitation. It is an emergency procedure consisting of mouth-to-mouth respiration and chest compressions. CPR with rescue breaths allows oxygenated blood to circulate to vital organs such as the brain and heart. CPR can also keep a person alive until further treatment can be administered to help the victim in cardiac arrest. 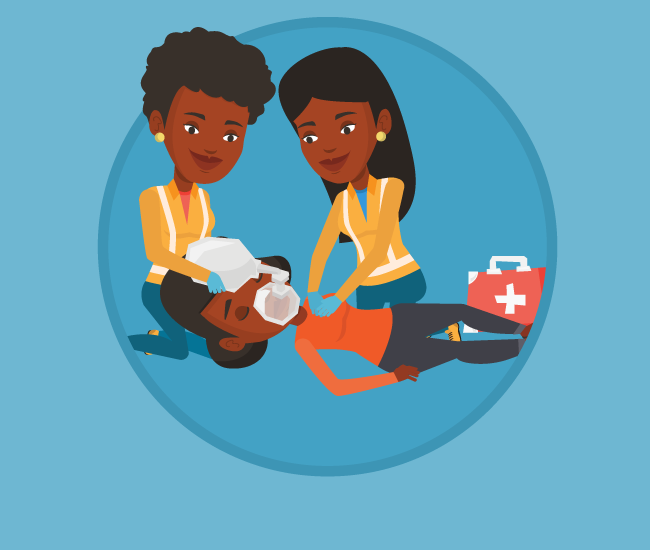 CPR started by a bystander doubles the likelihood of survival for victims of cardiac arrest, which can occur after electric shock, drowning, or heart attack. CPR is a combination of rescue breaths and chest compression. This is because rescue breaths fill the victim’s lungs with oxygen, and compressions provide the victim with oxygen-rich blood until a heartbeat and normal breathing are once again present. CPR is most important because if blood flow stops, permanent brain damage or death can occur within minutes. Recent reports show that a return to health can occur after 38 minutes of CPR, however. It is very important that blood flow and breathing be continued until the next level of trained medical help arrives. Now, let’s break down what CPR definitively means, word-by-word. This refers to the heart, the muscle in our chest cavity that pumps blood, contracting and expanding over 60 times per minute. Electrical impulses automatically keep the body alive through the heart, who’s function is to pump blood that is rich in oxygen from the lungs to the rest of the body. When the heart stops, oxygen can’t reach the rest of the body, and the vital organs begin to break down. In a matter of minutes, tissue in the body begins to die which can result in brain damage, or worse, death. This refers to the lungs. A person takes about 15-25 breaths per minute. Every time you take a breath, your lungs fill with oxygen vital for functioning. This is because oxygen and sugar are combined and become fuel to keep the body going. The tissues in our body do not store very much oxygen, and therefore, must be replaced Tissues within our body store little oxygen, so oxygen must be restored constantly. This means “restoring life of someone who appears to be dead.” As soon as your heart stops, your lungs stop getting necessary oxygen, and when it runs out completely, cells and tissues begin to die, which can result in brain damage. 4-6 minutes is the average length of time before a cell begins to die, and after revival of the body is not possible after 10 minutes. Without CPR, many would only be able to stand helplessly by while a loved one or stranger dies, but with CPR, there is hope for the person recovering and living. Stepping in and skillfully administering the lifesaving method that is CPR is one of the greatest things you can do for someone.